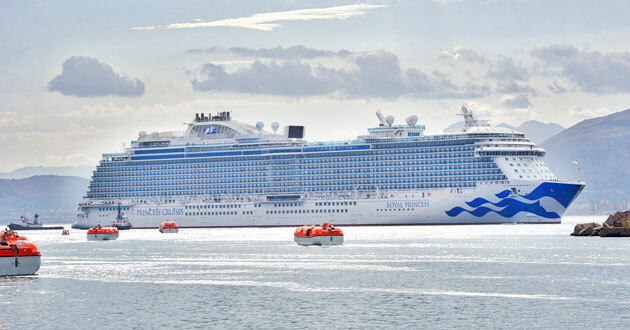 (11:45 a.m. EDT) -- Princess Cruises' Royal Princess unveiled brand-new livery as it emerged from dry dock in Palermo, Sicily, October 7. Flaunting the line's new logo on its hull, the 3,600-passenger Royal Princess is the first ship in the fleet to feature the new design, which is set to be rolled out fleetwide. The happiest place in the world now exists for foodies and wine lovers. River cruise line Adventures by Disney has revealed a new, adults-only Rhine Food and Wine Cruise for next fall. Hosted by Disney Culinary Director John State and Master Sommelier Brian Koziol, the weeklong sailing will kick off October 21, 2017 in Basel, Switzerland, and visit wine regions throughout France and Germany before ending in Amsterdam. Highlights include local beer and Alsatian wine pairings, a French patisserie class in Strasbourg and a private cocktail-blending class. The cruise is one of 15 offered along Europe's Danube and Rhine Rivers, on AmaWaterways-chartered ships. Cruisers renting beach loungers at Royal Caribbean's private Bahamian island CocoCay will no longer receive any additional amenities, according to RoyalCaribbeanBlog.com. Rentals previously included a cooler with two bottles of water, a fruit plate, floating mats and a free tram ride to and from the tender, as well as to and from lunch. Beach loungers will continue to come with clamshell umbrellas. As a result of the change, the line has lowered the rental cost from $59 to $45. Cunard's flagship Queen Mary 2 will celebrate International World Space Week in October 2017, by welcoming a number of space exploration experts on an eastbound transatlantic cruise. From October 4 to 10, passengers can sail under the stars with Dr. Jeffrey Hoffman, NASA Astronaut, Scientist and former Shuttle Pilot; Charles Barclay from the Royal Astronomical Society; Stephen Attenborough, Commercial Director of Virgin Galactic and Ken MacTaggart, NASA Historian. The newly refurbished ship also boasts the only planetarium at sea. MSC Cruises aims to enhance its offerings for kids with "Kelly & Kloe On Board," an original web series, created exclusively for the cruise line. The series focuses on the exploits of sisters Kelly and Kloe, who sneak off to go on adventures around the ship while their father thinks they're in their cabin studying. The program, which has several episodes, will help children see what a cruise is like before boarding and allow them to relive the experience after they're back on land.